Here’s a scam so bad even Mickey Mouse took a stand. Guests in hotels around Disney World have been finding pizza delivery menus conveniently slipped under their doors, but place an order–and make the mistake of giving your credit card number–and you’ll really pay. The phone number isn’t connected to a pizza parlor but to identity thieves. Disney World supported a law designed to crack down on the people handing out the fliers, but Orlando police say the problem persists. Solution: If you’re craving a slice, get a recommendation from the hotel. Planning a Getaway? Get Here First! 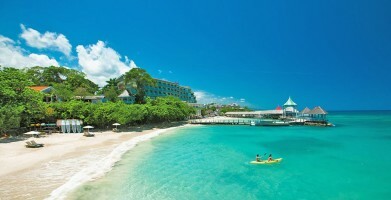 When it comes to getaways, Sandals delivers a world of options – in the world’s most breathtaking locations. From secluded beaches to family-friendly resorts, Sandals Luxury Included® Vacations offer more quality inclusions for the most fun in the sun! Atmosphere, amenities, activities – as Certified Sandals Specialist Travel Agents you can trust us to tailor your vacation or honeymoon to your dreams and desires. Rest assured we’ll match you with the perfect Sandals or Beaches Resort. As we know, one size fits only one! Before you book, join us for an insider’s look; meet the Sandals Resorts expert who just returned from the Caribbean and take advantage of special perks only available to those who attend. Take advantage of these incredible savings offers! *Offers are subject to availability throughout promotional period, applicable to specific resorts, room categories and based upon a minimum night stay. Offers may be changed or withdrawn at any time. Other restrictions and limitations may apply.